Mark Yates made his second signing today with the arrival of Francino Francis from Watford but it's a signing that could have far reaching re-percussions. 'Franco' is a solidly built forward that looks, from his photographs, like the proverbial man mountain and by all accounts he likes to get stuck in too. He was described by the Harriers manager after he had put pen to paper today as "a big, strong, powerful centre-forward who definitely knows how to score goals." 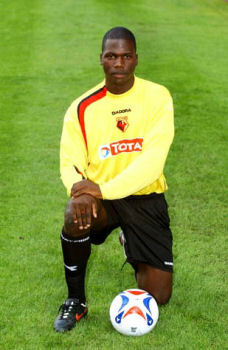 19 year old Jamaican born Franco started his career as an apprentice at Stoke City but was snapped up two years later by Watford for their academy. He has already made some first team appearances in their Carling Cup games against Wolves and Wigan and he also came on as a substitute in the Watford's 0-0 draw with Leeds United in a League game in October last year. He has joined the Harriers on another of those dubious 'work experience' deals and will be with us until the end of the season all being well. The 'far reaching re-percussions' will come about because it looks likely that now Francis has arrived here that the KHFC board are now trying to ship out Iyseden Christie to Rochdale. There is a question of a fee for the Harriers leading scorer and for once it looks like the board are either trying to price him out of the market or force him to stay until the end of the season by turning it into a bidding war with other clubs. Personally I'd rather see him stay until the end of the season and forge a formidable partnership with the new boy. The problem is that the board need as much money as possible incase certain outstanding loans are called in. Francis will almost certainly make his debut tomorrow against Scarborough as will the other new signing Jonny Harkness.